There’s no special trick to conducting an interview. All it requires is a little patience, an ear for the important utterance, and the simple knowledge that to most people the sweetest possible music is the sound of their own voice. I’m back, after a hiatus of reading other stuff for one reason or another, to working through David Housewright’s superior St. Paul-based detective series starring hobby investigator Rushmore “Mac” Mckenzie. Mac quit the police in order to accept a large finder’s fee from an insurance company, after locating a big embezzler for them. 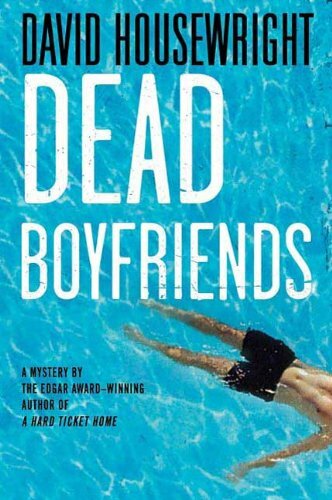 Dead Boyfriends begins with Mac just trying to help out. He finds a woman, drunk and filthy, on her lawn, screaming about her dead boyfriend. Going inside, he finds the boyfriend several days dead, and proceeds to call the St. Paul police. The cop who shows up roughs the woman up, and Mac tries to cool him down. That earns him 36 hours in a police cell. When he gets out, he’s eager to help the woman’s lawyer, who thinks she can get her off and win a big damage suit from the city to boot. Getting the case dropped is easy, but the repercussions are bloody, and the threads of the expanding mystery reach into the highest levels of state politics. At the end, Mac will face a hard choice, balancing his sense of justice against his respect for the law. Good story. It got kind of convoluted at the end, but I’m liking McKenzie more and more. The political comments seem to strike right and left pretty evenly, but some statements are made about government that suggest to me that the author has some sensible opinions. Cautions for language and mature themes, but not too bad.